El Nino Ruined Southern Africa's Harvest. The Race Is On To Stop A Looming Food Disaster : Goats and Soda El Nino ruined this spring's harvest. Can food aid — and maize seeds — be delivered in time? 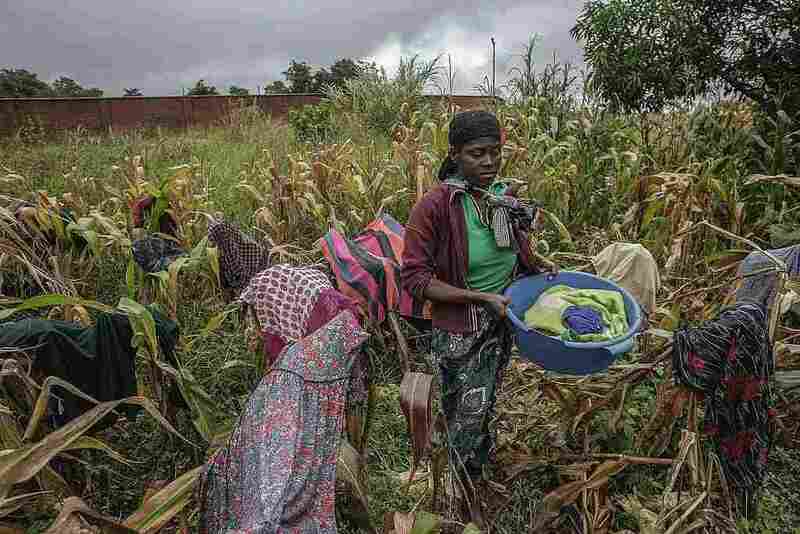 A woman dries clothes in a failed maize field in the north of Malawi. The "storm" that has Cousin and other officials so worried is a looming food crisis expected to afflict at least seven countries across Southern Africa in the coming months. It's projected that by next March as many as 18 million people will need food assistance. 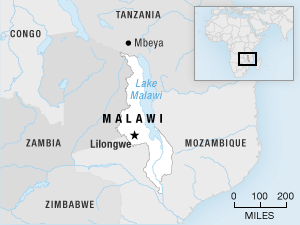 In Malawi alone, an estimated 40 percent of the population will need help. The cause of all this impending misery is a drought brought on by El Nino. The weather phenomenon began last fall, just as the region's annual planting season was getting underway. In not just Malawi, but also Zimbabwe and Lesotho, this dry spell came on top of erratic rains the previous year. By spring — harvesting season — it was clear the El Nino drought had proved far worse. "I've been meeting with farmers who had, at best, only half their projected harvest," said Cousin, speaking by phone from Malawi. "And many others have no harvest at all because their crops were so stressed by the lack of rain." That's devastating in a region that relies almost exclusively on one crop, maize, and has only one major growing season. Many family farmers rely on that one harvest to provide them with enough food stores to last the entire year. Already, hundreds of thousands are running short — including, says Cousin, many people infected with HIV/AIDS, which has been a chronic threat in the region. This, in turn, compromises their treatment with antiretrovirals, because their bodies need adequate nutrition for the drugs to function. In other words, "the food security problem is starting to spiral into a health crisis as well." Then there are the many who are not currently going hungry, but who, in order to feed themselves, are already resorting to measures that will bring serious consequences down the line. Chris Nikoi, director for WFP's Southern Africa Region, says a classic example is a family that has to sell one of their few assets — say, a goat — to buy the food they would have otherwise grown for themselves. "Instead of using the goat to provide milk for their children long term, they are forced to sell the goat to get food for their kids today." The WFP hopes to roll out plans to help 11.9 million over the coming months — if it can get the resources. All told, WFP officials say they'll need $535 million to address the food crisis in Southern Africa. Nikoi says the United States has been the most responsive in terms of stepping up with funds. But, he says, it needs to do more — and other donor countries have been distressingly slow to make commitments. And he adds that around $200 million is needed right away because WFP has to get its food aid into position before the fall rains make many areas of Southern Africa impassable. This is a challenge every year. But it's expected to be a particular obstacle next fall because of another twist: Once El Nino wanes, it is generally followed by La Nina — which brings substantially wetter weather than usual. "We're in a race against time," says Nikoi. The silver lining: There's always the chance the extra rain will make next year's harvest a bumper crop. But, says Nikoi, only if aid groups can get farmers enough seeds to take advantage of the opportunity. Otherwise, he says, they'll be forced to eat what maize seeds they have instead of planting them.